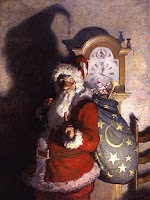 Am I alone in thinking that the shadow on Santa Claus in this Wyeth painting looks a whole hell of a lot like Oogie Boogie? This entry was posted in Uncategorized on December 15, 2007 by gala5931. that shadow was creeping me out… and now i know why.